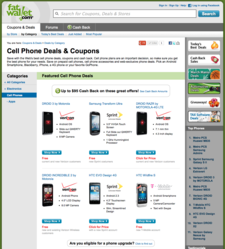 Shoppers looking to upgrade their smartphones to newer technology can find and compare dozens of competitive mobile plans offering free, or price-reduced smartphones and up to $95 in Cash Back, all at one user-friendly resource on FatWallet.com’s cell phone store page. Compare the best smart phone deals and plans. Online shoppers will find many popular smartphone models and affordable mobile plans to compare and save hundreds of dollars for the individual or the entire family. FatWallet, the preferred online shopping resource for millions of savvy consumers, announces several prime opportunities for cell phone users to upgrade to smartphones at the FatWallet Cell Phone Store. This user-friendly resource offers online shoppers significant savings on mobile plans, new phones, apps and accessories. Plus, FatWallet members can earn up to $95 in cash back rewards from more than 27 online retailers. One of the newest packages from Verizon is offering FatWallet shoppers a free Droid 3 by Motorola ($150 savings) with a 2-year Verizon Wireless agreement and data pak (required). This deal includes a free desk charger ($50 value) and a free car mount ($60 value) making a total savings of $260. Adding bonus savings of up to $95 FatWallet Cash Back makes this one of the best smartphone bargains available anywhere. For more deals like this, follow us on Twitter at: http://www.twitter.com/fatwallet or like us on Facebook at: http://www.facebook.com/fatwallet.